Govt. College University, Faisalabad (GCUF) was founded as a primary school in 1897 and was granted the status of university in 2002. GCUF aims at developing stronger linkages between university and communities and that’s why it always remains engage for the betterment of society. The University is playing a very effective role by educating people regarding dangerous diseases, Healthy Environment, Safe and healthy food etc. Anti Dengue Campaign, Breast Cancer Awareness Seminar, International Conference on Environmental Changes & Green Expo, 1st & 2nd International Conference on Safe & Healthy Food are some examples that shows that how Govt. College University Faisalabad is serving the human being. Dengue is a viral disease spread by dengue vector Aides mosquitoes especially Aides aegypti and Aides albopictus. There are 4 types of viruses involved, DEN1, DEN2, DEN3 and DEN4. In Pakistan DEN 2 is most prevalent. As there is neither treatment vaccine for this disease, so we have to control vector (mosquito) to control this disease. We can control mosquito chemically, biologically as well as by reducing its breading sites. In 2011, Punjab Govt. used a lot of chemicals to control mosquitoes but could not get rid of this. But during 2012, Punjab Govt. stressed upon the source reduction and got a tremendous success in controlling mosquito. During 2011, more than 1000 people died but during 2012, No causality was recorded in Punjab province. Due to these activities, a lot of awareness was created among the people. Now people are not afraid of mosquitoes instead they are helping the Govt. to reduce this menace. Govt. College University Faisalabad played a vital role to control this dangerous disease in Faisalabad city and its allied territory. The Worthy Vice Chancellor Prof. Dr. Zakir Hussain constituted a committee named Committee for Dengue Control (CDC). CDC arranged awareness walks on 26-08-2012, 09-09-2012, 23-09-2012 and on 24-02-13 to create awareness among common men at the streets. CDC distributed hand bills containing information about dengue. CDC delivered speeches in different colleges, within the city and outside the city in 2012 and 2013 like Govt. Islamia College for Boys Faisalabad, Municipal Degree College Toba Tak Singh, Boys College Chiniot, Govt. College University Faisalabad and etc. CDC also arranged a national level seminar on Dengue Awareness with the cooperation of a local NGO, in which Dr. Waseem Akram (Advisor to Chief Minister Punjab for Dengue Control) delivered a comprehensive lecture that what kind of measures can be taken to control dengue mosquito. In Govt. 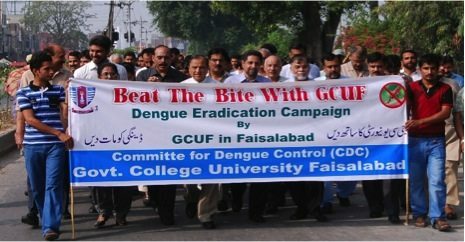 College University Faisalabad, we have successfully established a research wing on dengue mosquito. Now the scientists of Govt. College University Faisalabad are doing research on different aspects to control this mosquito especially on botanical and genetic diversity. In this regard, Dr. Shabab Nasir (Asst. Prof) in the department of Wildlife & Fisheries went to USA to present his work and attended the meeting of American Mosquito Control Association (AMCA) last month, while he was the only scientist from Pakistan. Pakistan has the highest rate of breast cancer in Asia. This was stated by speakers at a seminar held in connection with World Cancer Day. It was arranged by the Directorate of Medical Sciences, Government College University Faisalabad, on the direction of GCUF Vice-Chancellor Prof Dr Zakir Hussain, in collaboration with Higher Education Commission, a private media group and a cell company. 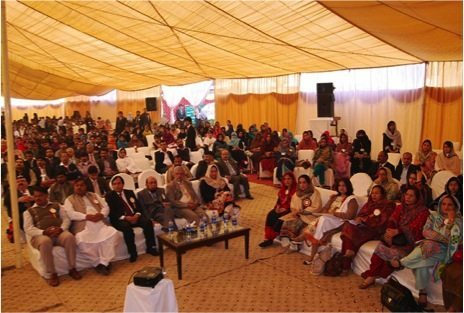 Faculty of Sciences and Technology Dean Prof Dr Naureen Aziz Qureshi was the chief guest while the Directorate Director, Prof Dr Riaz Hussain Dab, was the key speaker. Dr Naureen Aziz said early diagnosis increases a patient’s survival chance by more than 90 per cent. She stressed the need to create an awareness campaign to address the issue at the national level and to educate the women to have a self-examine at least once in a month. She also told the audience that healthy food free of fat and exercises are one of precautions. She said incidence of the diseases is increasing in young girls in our homeland. She said prevalence of breast cancer is the highest among all the cancers in Pakistan with 38 percent. She said that cancer was the silent killer as it starts painless. When the disease spread, the patient suffered from the pain. Dr Riaz Husain Dab said that one out of the nine women in Pakistan was at the risk of the breast cancer. He said that if anyone’s ancestor was the victim of any type of cancer, he/she had disease risk ten times more than other people. He said that breast feeding helps reduce the risk of the breast cancer. He also suggested to set up breast clinic at the ever hospital to reduce the increasing impact of the diseases. Dr Kiran Fatima said that cancer is a leading cause of death worldwide and accounted for 7.6 million deaths (around 13pc of all deaths) in 2008. She said usage of vegetable and fruits must be enhanced in the routine life and preserved meat should be avoided to lower the impact of cancer. Ms Samia said excessive use of preserved meat was also responsible for the exposing someone to the risk of cancer. She said coffee, tea and smoking also become causes of the cancer. She also said that the red meat also moved someone to the cancer risk. Dr Asif Saleem stressed the need to joint efforts to aware the masses to cope with the disease as the country was the worst victim in the Asia. Advisor HR Shiekh Akram, QEC Director Dr Zubair Siddique and other notables were present on the occasion. Faisalabad Institute of Textile & Fashion Design, GCUF in collaboration with College of Pharmacy, GCUF organized Anti Drug Painting Competition dated June 22, 2012. The focus of the said competition was to find out that what factors make youth drug addict, its side effects and then what preventive measures should be taken. The Department of Environmental Sciences, Government College University Faisalabad organized a seminar on the World Environment Day at Resource Center, Murree on June 5, 2012. Dr Zakir Hussain (Vice Chancellor, GCUF) was the chief guest. The seminar included presentations by eminent resource persons, including Dr Adila Batool (Punjab University), Dr Zahir Ud Din (NUST), Dr Muhammad Sarwar (Agriculture University Faisalabad), and Dr. Farhat Abbas (GC University Faisalabad). After the seminar, Environment Walk was arranged. 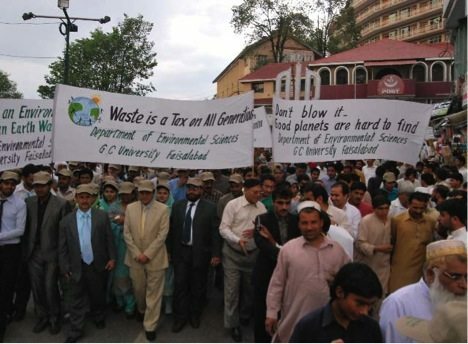 Participants from local schools, colleges, WWF, and EPA Pakistan joined teachers and students of Government College University Faisalabad led by GCUF Vice Chancellor led the walk from Murree Post Office to Kashmir Point. The seminar and the walk will create awareness among the masses about different environmental issues, narrated by Dr. Farhat Abbas (Chairman, Department of Environmental Sciences). He further added that it will provide an understanding to protect our environment in a framework of rapidly expanding economies and global changes. Faculty of Science and Technology Dean Prof Dr Noureen Aziz Qureshi, University of Agriculture’s NIFSAT Director General Prof Dr Faqeer Anjum, Institute of Home and Food Science Director Dr Nighat Bhatty and Department of Food Sciences Incharge Dr Muhammad Umair Arshad Bajwa also spoke. GCUF Deans Prof Dr Shahbaz Arif, Dr Tahir Tounsvi, Prof Dr Pervez Azeem and MPA Muhammad Islam were also present on the stage. Prof Dr Zakir Hussain stressed upon the all stakeholders to create a roadmap to address the issue at national level by giving awareness to the masses about the usage of balanced food and proper establishing the food industry. He said that food sector being a second largest industry of the country is contribution as many as 21 percent of gross domestic product of the country with 36.7 billion US dollar. The government has allocated US $ 142.4 million for the year 2012 to further enhance the productivity. He stressed the need to ending the following the standards of food processing. The malnutrition is caused by lack of knowledge of balanced food, high illiteracy rate and poverty. Talking about wheat, he said that the wheat is a staple diet and constitutes 60 percent of the daily diet of a common man. He said increase in wheat has touched 25 million tonnes in 2011-12 from 22 million tonnes in 2008-09. But more steps are needed to further improve the situation. He pointed out too much deficiencies of Vitamin D and Vitamins B exist in our population, producing malnutrition. The diet can play a major role in overcoming the situation by leading to a healthy life. Prof. Bilal Qutab, a renowned religious scholar delivered a lecture on Character Building on January 17, 2013 at 11:00 am in the Allama Iqbal Hall, Vice Chancellor Secretariat, Govt. College University Faisalabad Pakistan. This informative session was open for all of the faculty members, students and administrative staff of the university.